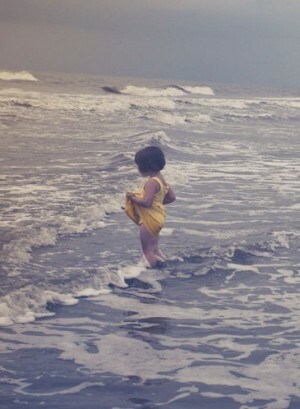 A young girl holds her luminous yellow dress above the small tide of the ocean shore, a firm contrast against the gray-blue water and the white-encrusted waves that seep forward relentlessly toward the dark-haired girl as she watches on, hypnotized by their murky dance. In the next image, a bundle of slightly crushed, tiny white flowers lies elegantly on a coffee table, which holds myriads of memories of its owners in the stains and scratches distinctly visible on its antiquated, wooden surface. And let’s not forget the colorful paper chains which line a ceiling, taking the focus away from a white-haired woman, covering her face with a blanket as sheer and brilliant as her own hair. Only to find her wearing yellow in the image below, a complementary radiance to the sunlight flowing into the room, as the camera closes in on her. These are a minute few of the copious amounts of photographs that Amy Hildebrand has taken in her career. Apart from one particular detail, the Cincinnati-based photographer is no different than the average person. She went to public school, struggled with classes in high school, and attended college to exercise her passion. She married, became a wife and a mother of two, nurtured her children, and in the process grew her devotion to expressing emotionality and perception through photography. But in the face of these ordinary accomplishments, there’s more to her than meets the eye — quite literally. Hildebrand has violet eyes and a limited ability to see. These are just two side effects of albinism, a congenital disorder characterized by the absence of melanin or pigment in the body, a condition that the American artist with stark-white hair and pale skin has been battling since birth. It was not until high school — when she underwent an experimental surgery that gave her a higher degree of sight — that she was finally able to fully draw in the scope of the world. Before, everything had been much of a blur for her; a mishmash of scenes and people left unrecognizable by sight. The calm and sincere tone of Hildebrand’s voice expresses a modest view of herself. She accredits these sentiments to her family and upbringing that always stood by her side, giving her an improbable confidence in the person she was then and still is today. After ruthlessly searching for support groups for children with albinism, Hildebrand’s parents were disappointed by the cynicism surrounding the lives of people with the condition. Not satisfied with such disparagement, they chose to raise her as if she were a completely normal child. “They decided that they were going to raise [me] like any other child, and I’m so thankful for that because I don’t feel that I’m any different from anybody,” Hildebrand reflects. She recognizes that her natural eye for photography could have turned out differently had her parents taught her that she was limited in her abilities. Instead, the photographer had no qualms about pursuing a visual art, although at the time, she lacked the visual capabilities of her peers. Hildebrand’s upbringing not only awardedher confidence, but also paved the way for the rest of her siblings. Out of six siblings, four have the condition, including Hildebrand herself and an adopted Indian girl. However, in tune with how she was raised, she sees her siblings as just that, and nothing more. To her, her brother is her brother, not her brother with albinism. Hildebrand’s eyesight is hardly an obstaclefor her. She considers her only challenges, as a result of albinism, to be light-sensitivity and her pale, unprotected skin that needs to be continuously lathered with ample amounts of SPF100 or SPF150 to protect it from the perils of the sun’s rays, as she is more prone to developing skin cancer. “Besides that, my life isn’t very different from anyone else’s. I guess it’s more of a mindset — I choose to look at my life like it isn’t different from anyone else’s,” she says. Even as a shutterbug, Hildebrand is not fazed by her situation. In high school, and to this day, she sees photography as an art form that granted her the ability to communicate her own mentality and appreciation for life. “I feel like [the camera] is an extension of me, it has become a part of me. I carry it everywhere; I only buy bags that it’ll fit in. It has become a true extension of my eye,” she says. The camera she so highly appreciatescompensates for her lack of sight; while she produces stunning imagery that acknowledges the daily life that all humans share. Her photographs are characterized by abstract colors and intriguing blurriness that makes the images slightly vague, allowing the viewer to feel a sort of personal association with her work, as if the pictures were a memory. While some photographers perceive editing programs as tools that negatively manipulate art to force a meaning upon the viewer, Hildebrand uses Photoshop to extend her sentiments and to provide an accurate view into her life. Editing her photographs evolves daily, depending on the vibes of that day and on the individual shot. “A lot of people have asked, ‘how do you get this effect, how do you get that effect,’ honestly it’s different every day,” she states. One day, a photograph remains as it was taken to convey a literal meaning, such as a heart-shaped imprint of a tight shoe on a child’s foot, or a young girl crying with a towel over her mouth. Such captured depictions display a personality, which is perhaps not so different from any other child. Other days, a photograph will be edited with colors and overlays to convey an abstract and emotional meaning, like a blurry image of a child flying into the air on a swing or colorful halos of light around an active youngster, unaware of its surroundings. “I just wanted to express the fleetingness of life and how appreciative I am, and how I just want to see the good of every single day,” she further explains.